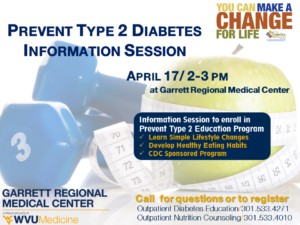 Garrett Regional Medical Center is hosting a “Prevent Type 2 Diabetes Info Session” on April 17 from 2:00 to 3:00 p.m. According to the Centers for Disease Control, one out of three adults has prediabetes and nine out ten do not know they have it. The info session, sponsored by GRMC’s Outpatient Diabetes Education Program provides an overview of the Prevent Type 2 Diabetes class aimed for participants who have developed or are at a high-risk of developing Type 2 diabetes. The curriculum for GRMC’s Type 2 Prevention program is approved by the Centers for Disease Control’s National Diabetes Prevention Program. The curriculum features nutrition education, stress management techniques and motivation-building activities. Individuals can go to https://doihaveprediabetes.org to determine their risk for developing prediabetes. 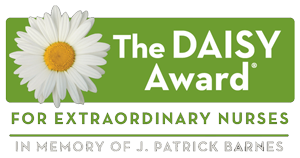 For further questions or if an individual is interested in participating in the program and is unable to attend the April 17 info session, they may call the Outpatient Diabetes Program at 301-533-4271 or the Outpatient Nutrition Program at 301-533-4010.